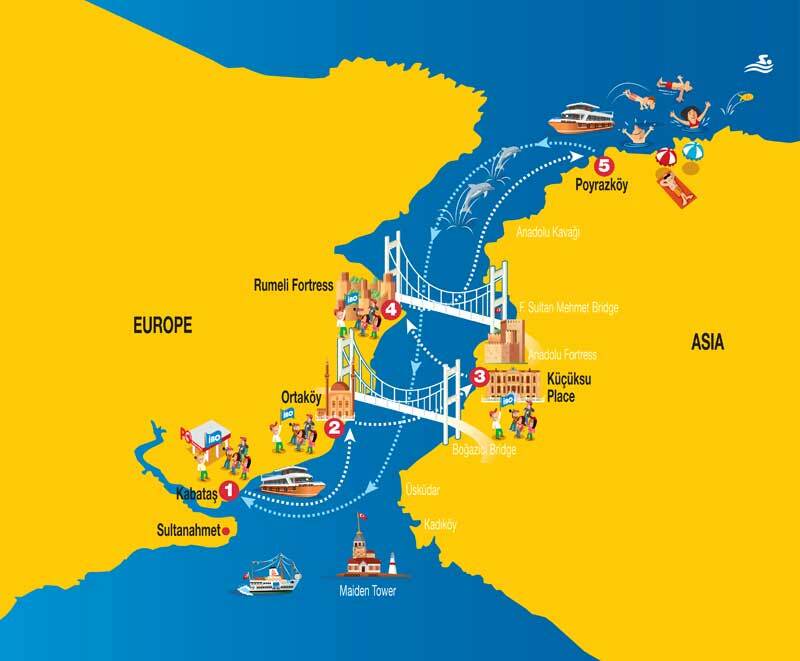 See Europe, Asia and the Black Sea with our most popular Bosphorus & Black Sea Tour. Explore Istanbul on a full-day cruise along the Bosphorus Strait and the waters of the Black Sea! With an onboard guide, learn about Istanbul and enjoy three stops to discover some of the landmarks. See where the city’s Ottoman-era sultans spent summer vacations at Ortaköy and Rumeli Hisarı Fortress, and take a tour of Küçüksu Palace-one of the city’s gems. Swim in the Black Sea at the coastal village of Poyrazkoy or explore the medieval ruins of Anadolu Kavağı. An onboard lunch featuring Turkish meze is also included. We will pick you up from your hotel and travel to the Kabataş port to board the sightseeing boat. Ortakoy isyour first stop, a charming Istanbull neighborhood on the city`s European side. Enjoy some free time to stretch your legs and explore the narrow and enchanting streets. Rumeli Hisari Fortress Explore the historical fortress constructed by Fatih Sultan Mehmet that marks the narrowest point of the Bosphorus. A fantastic place with a panoramic view perfect for taking photographs. Lunch on Board the Boat After exploring the fortress, you'll return to the boat for lunch while cruising the Bosphorus. You'll be served grilled chicken and traditional Turkish meze with soft drinks. Vegetarian options available upon request. Black Sea As you approach the northern end of the Bosphorus Strait, our tour will continue into the Black Sea. We will stop at a beautiful cove on the Asian side where you'll have the chance to go swimming and enjoy the sunshine. Anadolu Kavagi Our final stop is a picturesque fishing village on the European side. You'll have time to stroll around the village enjoy an ice-cream or waffle. We will return to the Kabatas port in the late afternoon and our service vans will drop you off back at your hotel. Discover the impressive sights along the shores of the Bosphorus, the waterway that divides Europe and Asia. Accompanied by our professional tour guide, you’ll also have the chance to get off the boat and explore some of the most beautiful sites. Leave the stress and traffic of the city center behind. Relax and enjoy the blue sky, a refreshing breeze, and take in some of Istanbul’s most impressive and inspiring sites. Enjoy a delicious lunch on the boat. We offer grilled chicken and meatballs accompanied by delicious Turkish ‘mezzes’. If you prefer, ask about our vegetarian options. Beer and wine are available for an additional charge. You’ll find that our Full Day Bosphorus cruise is one of the most satisfying, relaxing and fun experiences you’ll have in Istanbul. Book your tour now and find out why people say Istanbul is one of the most beautiful cities in the world. Bring your own swimming suites and towel. You will be able to swim off the boat. Age 0-2 years old children are free of charge.